The BGB-5F high-efficiency pharmaceutical coating machine is a special piece of lab equipment used for coating film on traditional Chinese and Western medical tablets and pills. This equipment has been manufactured in strict accordance with GMP standards, and the entire outer surface, coating drum (coating pan).spraying device and all parts that come into contact with the medicine are made of high quality stainless steel. The entire process is controlled using a microprocessor-based programmable control system, as well as manual control if needed. This control system features a wide range of applications, running state options, speed and temperature control, negative pressure control, complete display of all control parameters, and the ability to record and print the work state. All coating operations are carried out under air tight conditions that are free from dust emissions and liquid splashing, making the machine high quality, highly efficient, reliable, clean and energy saving, as well as easy to operate. 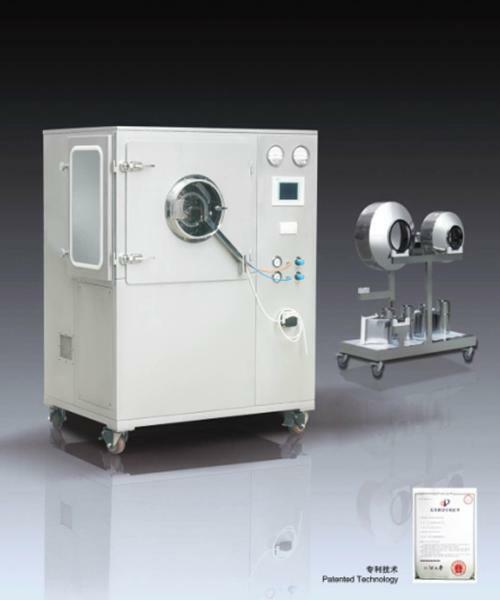 It is also a new variety of coating equipment that meets SOP regulations, and is often used as laboratory equipment. 3. It is the best model for exploring coating technology in pharmaceutical laboratories. 5. Replacement of the coating drum is convenient and fast.